Let’s say you run a company who wants to provide the fastest courier service on the market! It doesn’t matter if you deliver lunch, flower bouquets or mail – if you want to be the best you have to have well thought-out logistics and operate a strong team. But how to achieve that without spending too much valuable time on making plans for the next day? Today innovative companies have taken on board a solution that will help them work more efficiently and stay competitive. Additionally it will also help them save money and improve customer satisfaction remarkably. 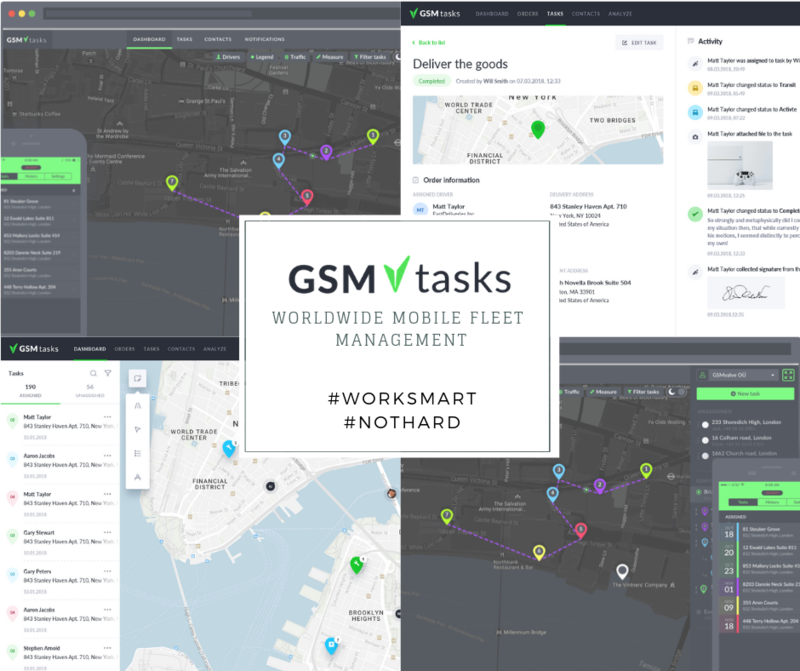 GSMtasks fleet management solution has 8000 active users worldwide who can confirm that the application has helped them save money and optimize work time after just one month. It doesn’t matter if you have 1 or 150 cars, use trucks or light vehicles – YOU can also start saving today! Let’s be honest, planning your routes and managing tasks manually is obsolete and will not only inhibit business growth but also increases your expenses on workforce, fuel and documentation. GSMtasks allows you to plan your work fast and will optimize routes for you in the best possible way. Let’s say it’s a regular workday and you have 4 drivers who have to complete 55 tasks in complete. You unfortunately only have one man to manage your fleet and those tasks. Sounds like a pretty time consuming job for one person doesn’t it? With our solution you can export your tasks from a program you’re already using (API) or from an Excel file just with a click of a button. Easy! For optimizing the routes GSMtasks considers the destination, delivery range, time spent on driving and loading or whatever indicators you might need to take into account. During the workday your drivers can use GSMtasks app on their smart devices and see all assignments already in optimized order. At the same time people working in your office will have a full overview of all the tasks and the company’s cars on the map. You can also make frequent tasks and routes appear automatically at the time you want or assign on demand tasks to the closest driver with a simple mouse click. This will help you reduce a lot of unnecessary work time and build a better reputation as a professional and well managed service provider. Have you thought about how many things you can nowadays do using an application? Pay bills or transfer money, buy a bus ticket, park your car or order dinner – everything can be done on your phone or tablet and save you a lot of time. Wouldn’t it then be reasonable that you will also save your workers from the paper load that just collects dust over time in your office? Digitalizing your documantation makes it easily manageable and allows your drivers to find everything they need fast even when they’re driving. 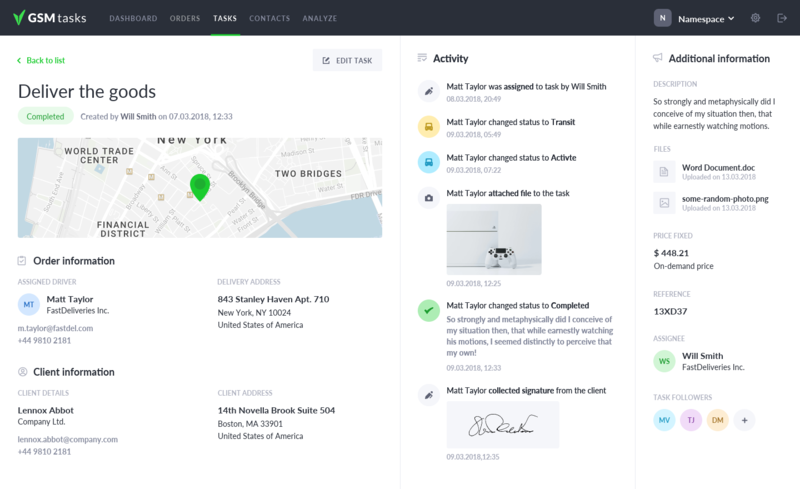 They can collect digital signatures, add photos to the reports and send clients personalized notifications when the task is completed. And let’s not forget the favour you’re doing to the Earth by giving up paper! Your drivers will also appriciate GSMtasks’s navigation service that is supported by both Google Maps, Sygic, Waze etc. It is especially useful if they have to navigate a lot in unknown areas or even make trips abroad. You sent your drivers off to work in the morning but have no overview what they’re doing during the day do you? Aren’t you interested in how much time was spent on completing each task or driving to the assigned checkpoint? It’s valuable information that could be used in managing your fleet better in the future. Now think how much easier it would be if you had a complete overview of your fleet and tasks on your desktop or phone at any time wherever you go! For example, when technical problems occur with one of your trucks you can easily assign new tasks to drivers that are closest and still manage to deliver everything on time. Notifications about any changes in delivery can be sent to both drivers and clients via the app. As a company that has 14-years of experience, has it’s own developers and rules the market we can offer much more to you than our competitors. We have clients from all over the world bigger and smaller who all have achieved remarkable result in both savings and business growth. If you think you could also benefit from GSMtasks then we are happy to help you! Contact us by e-mail info@gsmtasks.com and we will prove how much more you can get done with one day. Let’s work smart not hard!